All stock comes with either the HPEC shield logo or a stitched pony head emblem in one of three colours: yellow dun, grey or chestnut. 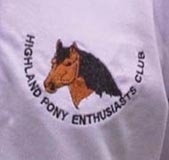 All items are high quality and come with a choice of logos as above as well as the words 'Highland Pony Enthusiasts Club'. We are reliably informed that this years must have purchase is a lovely fuschia pink ladies rugby shirt! Garments are available in sizes S,M,L,XL unless otherwise specified. As a guide the L size is about a 16 with the micro fleece being more fitted than the other items. Choose your item(s) as shown in the table below. Your order will be made up and posted out to you! Note: If you have any questions or queries about the HPEC promotional items range please contact Chris directly and she will be happy to help. A range of pencils, mugs and Christmas Cards as well as back issues of Highland Times etc. is also available. Available in: navy, black, cream, maroon. Available in: navy, green, black, maroon. Available in: royal, black, navy, green, maroon. Available in: black, dusky blue, navy550. Available in: lilac, pink, lemon, pale blue, red, black, navy, green, maroon, cerise, turquoise. Available in: blue, black, burgundy, emerald green, gold, red, dusky blue. Available in: navy, black, maroon, green, grey, royal blue, red.